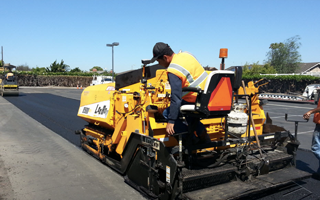 The following method applies to installation of new and/or existing asphalt drives, streets and parking lots. Major potholes, and other defects or conditions might require patching prior to overlay. If severe alligatoring exists, petromat fabric with overlay is recommended. Material shall be a fresh, dense graded hot asphalt plant mix that meets or exceeds Colorado State Highway Specifications. Manufacturer certification is available upon request. Repair area will be swept and blown clean for proper adhesion. After the repair area is clean and dry a tack coat of emulsified asphalt will be applied to the surface at a rate of 0.05 gallons per square yard. Any debris resulting from the process will be removed upon completion. Weight (ASTM D-1910): 4.0 oz./sq. yd., min. Asphalt Retention: 0.20 gals./ sq. yd., min. Asphalt pavement shall be cleaned using forced air and/or brooms for proper adhesion. The area to be covered with fabric shall be sprayed uniformly with asphaltic cement tack coat at a rate of 0.25 to 0.30 gallon per sq. yd. Tack application shall be accomplished with a pressure distributor for all surfaces except that, where the distributor does not have room to operate, hand spraying will be used. The binder shall not be applied at a temperature greater than 325 degrees F to avoid damage to the fabric. After the binder has been sprayed, the fabric shall be unrolled or hand placed on the binder as smoothly as possible. The fabric will be broomed or squeezed to remove air bubbles and allow complete contact with the surface. The fabric will overlap the adjacent fabric panel a minimum of 6″. Bituminous surface overlay coarse mixtures placed on top of pavement fabric will be placed at a mix temperature of 300 degrees F and not to be less than 1.5″ to insure compliance with manufacturer’s requirements.